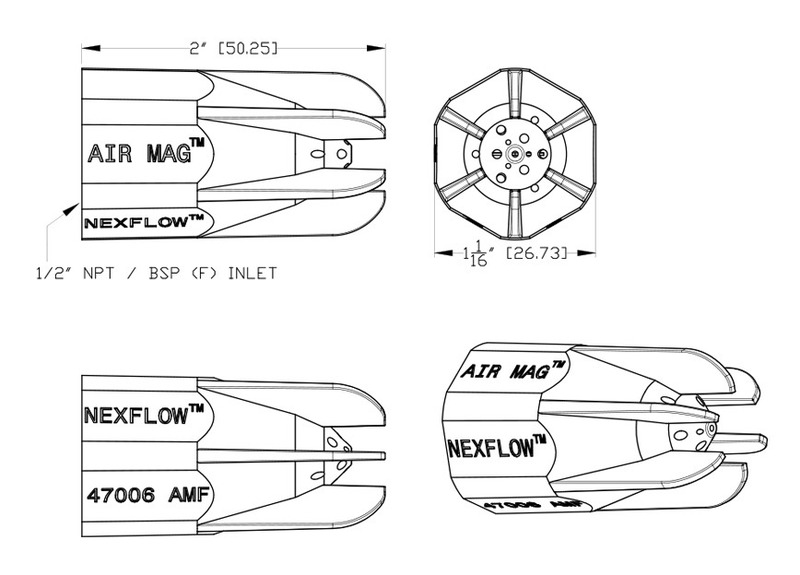 The Nex Flow™ Air Mag™ Air Nozzle is an engineered nozzle with a unique patented design to assist in focusing the compressed air from the supply line and entrained air from the surroundings to a sharper laminar flow of air with the highest force per SCFM on the market. This both reduces compressed air energy use and noise levels as compared to open jets and pipe. Even replacing competitive air nozzles can provide significant cost savings in energy and noise levels. The nozzle is of rugged, cast zinc, single piece design ideal for harsh environments and 316L stainless steel for food, pharmaceutical, and corrosive environment applications. 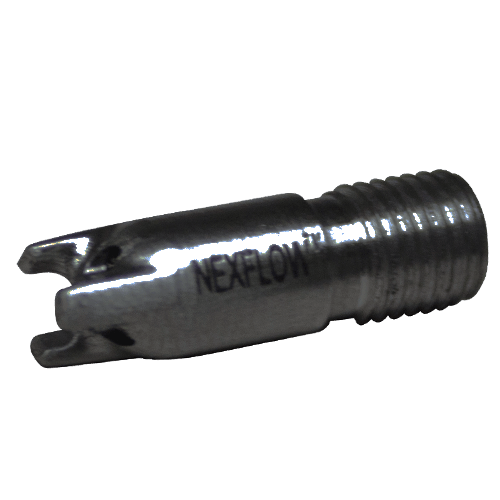 Nex Flow™ Air Mag™ 316L stainless steel amplifying nozzle – 4 mm. 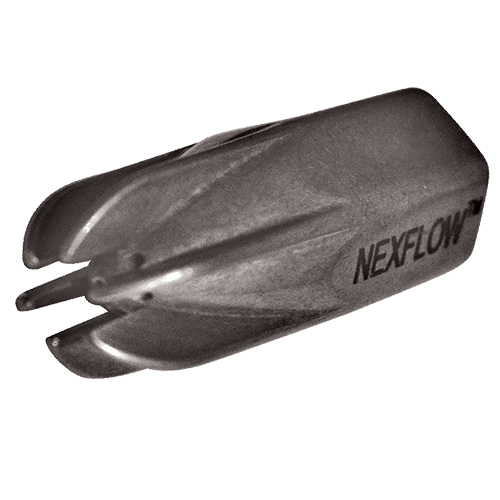 Nex Flow™ Air Mag™ 316L stainless steel amplifying nozzle – 5 mm. 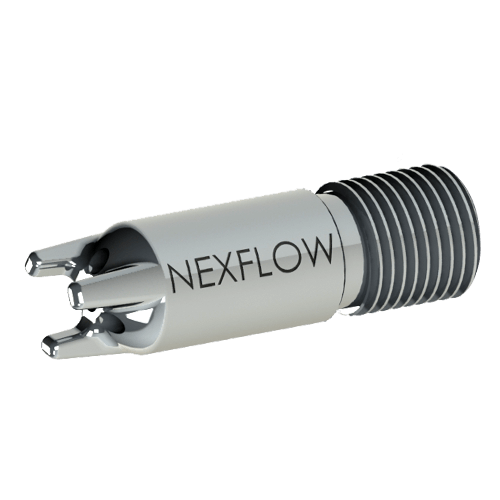 Nex Flow™ Air Mag™ 316L stainless steel amplifying nozzle – 6 mm. 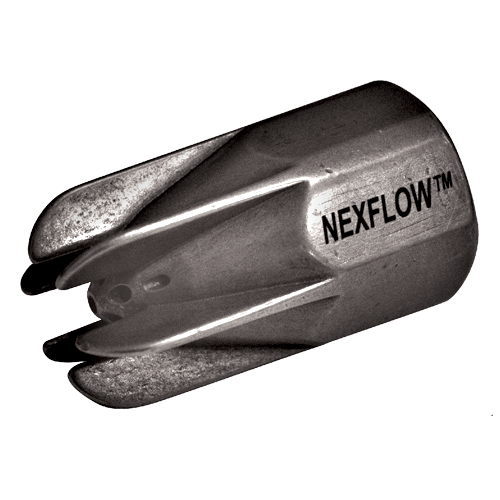 Nex Flow™ Air Mag™ 316L stainless steel amplifying nozzle – 1/8″ NPT. 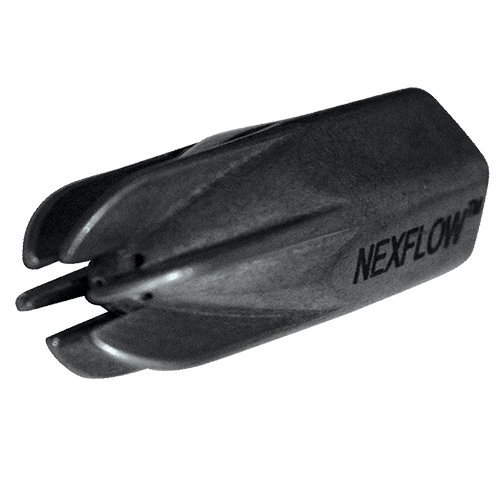 Nex Flow™ Air Mag™ peek amplifying nozzle – 6 mm. 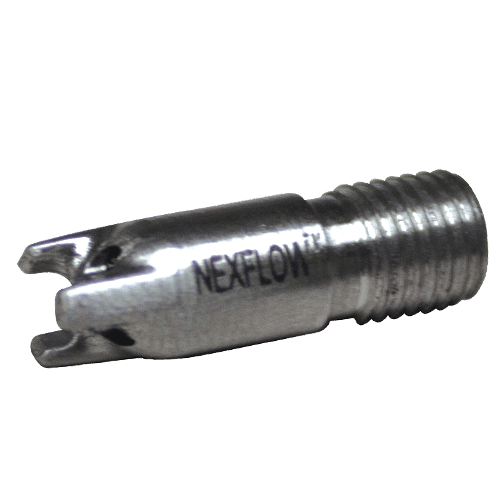 Nex Flow™ Air Mag™ peek amplifying nozzle – 1/8″ NPT. 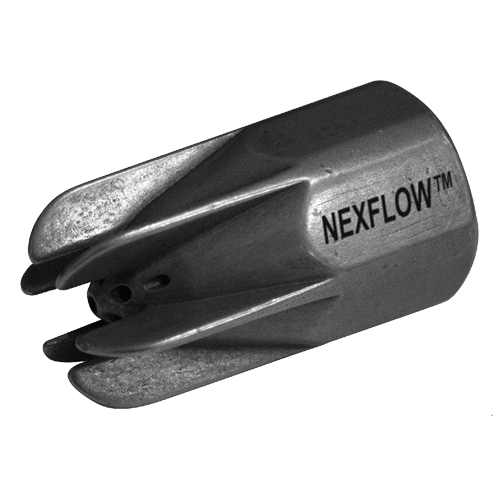 Nex Flow™ Air Mag™ zinc amplifying nozzle – 1⁄4″ NPT or BSP Female. 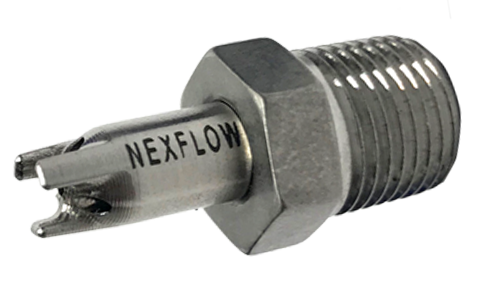 Nex Flow™ Air Mag™ 316L stainless steel amplifying nozzle – zinc amplifying nozzle – NPT or BSP Female. 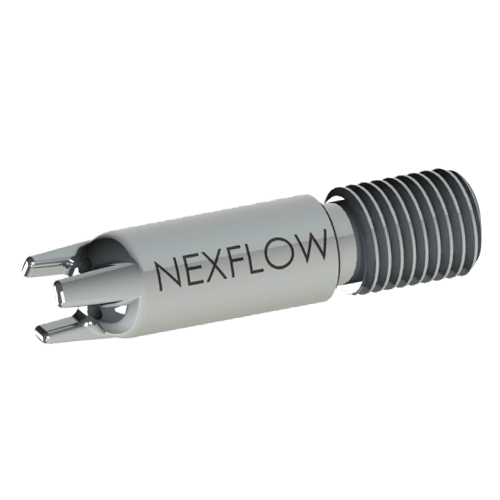 Nex Flow™ Air Mag™ zinc amplifying nozzle – ½” NPT or BSP Female. Compact 1 piece design for greater strength specifically designed to withstand industrial environments and more worker friendly i.e no chance for breaking or exploding like 2 piece designs. Patented hole design allows for the compressed air to exit with greater efficiency and reduced turbulence allowing the air to reach the target with zero drag. 10-20% more force per unit of air consumption compared with competitors and usable at greater distance due to high concentration of air flow and patented design. Engineered body design reduces the noise level by entraining the surrounding air and producing a lower exhaust noise level. 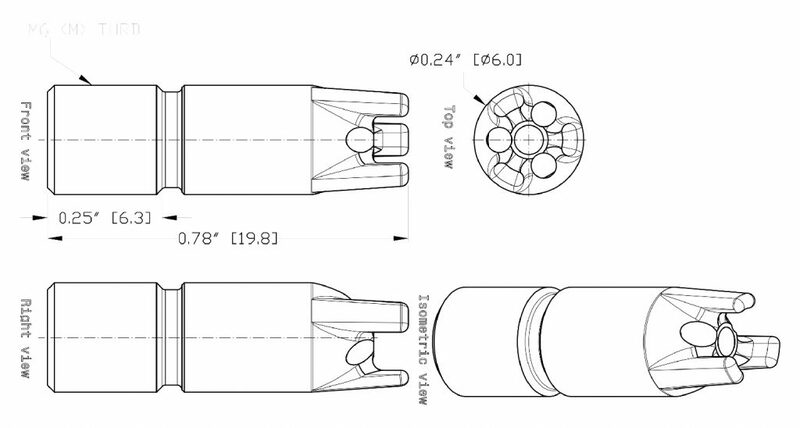 Concentrated flow to reach long distances. Workable at greater distances than competitive air nozzles. Ideal for cleaning CNC machines where metal chips could could bounce back on the face or, in breathing in wood working router produced dust if too close. Special outer shape and widely spaced fins allow for easy cleaning and buffed surface minimizes the sticking and collecting of dust and dirt. Precise machined threads, rugged design and the material quality means long life and unlikely to break. 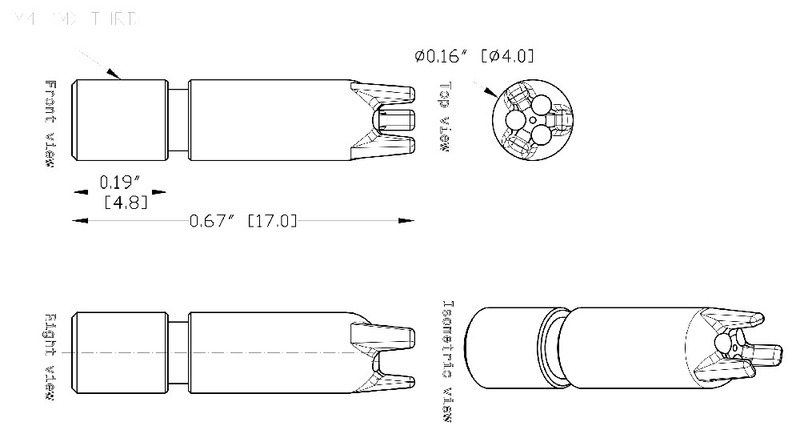 Especially ideal for point applications in which a nozzle is required to target a specific part at greater distance yet with a wide enough flow profile and force to equal that of competitive nozzles at a greater distance. 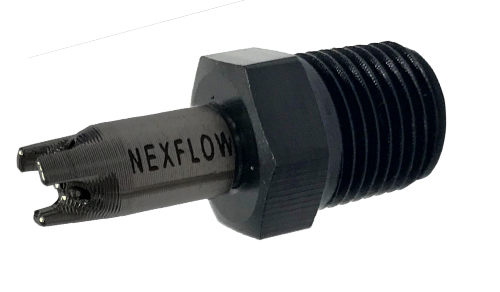 The Nex Flow™ Air Mag™ nozzle is designed so that the force at a particular pressure will be the same as a competitive nozzle of star profile design. This makes it easy to compare and prove the superiority of the Nex Flow™ Air Mag™ nozzle by simply replacing the other nozzle and seeing what happens. To do this, have a pressure regulator and gauge upstream, and if possible a flow meter upstream. 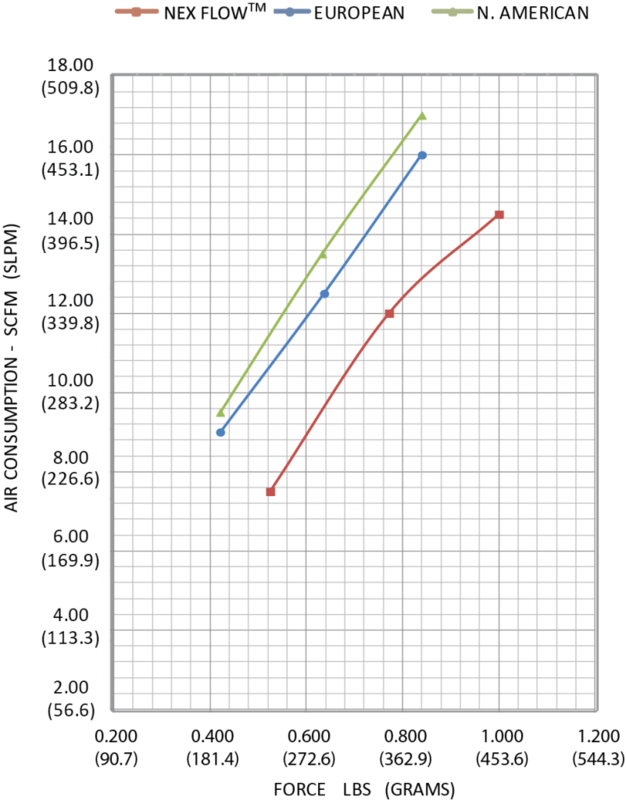 Either have a scale to blow against or just apply it for your particular application. 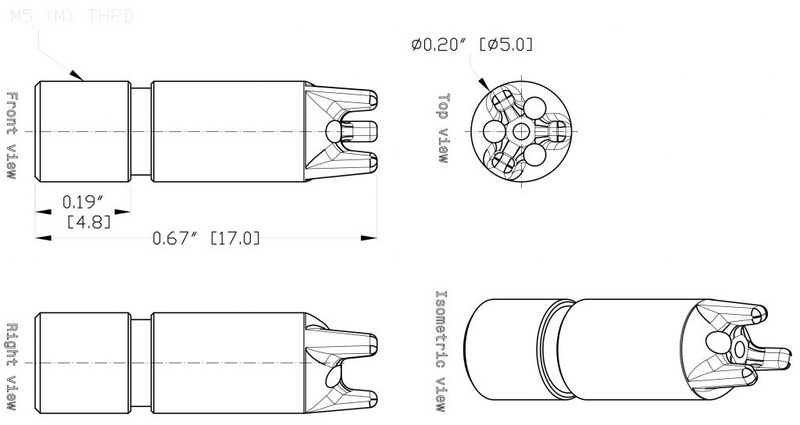 For each nozzle, adjust the pressure upstream to that it is the same for all nozzles tested. 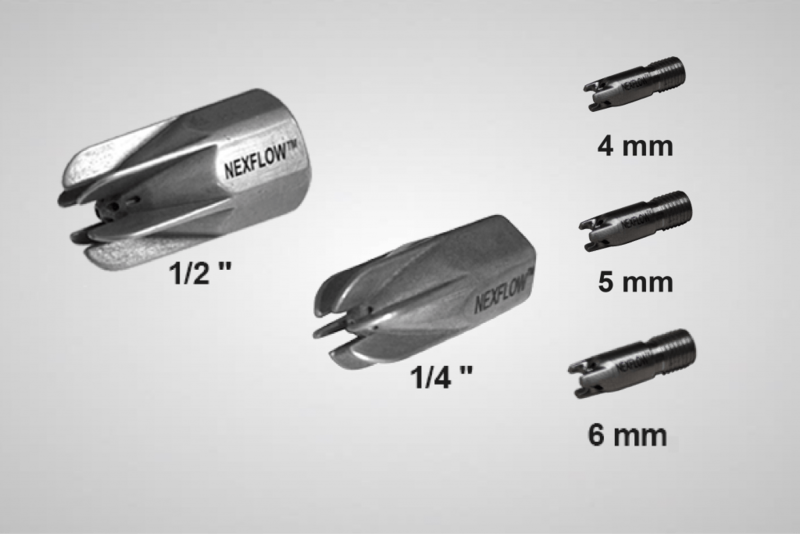 If you replace any competitive nozzle, you will probably have to cut back the pressure as you will get more force from the Nex Flow™ Air Mag™ nozzle. This is because the air consumption is “less” at any given pressure which also means less pressure drop in the line as the air flows out through the nozzle. So you will actually be getting a bit more pressure and force as a result. You can then cut back the pressure if not needed, thereby reducing compressed air use even more.